42 • FOODSERVICE EQUIPMENT & SUPPLIES • JANUARY 2014 A t Mighty Fine Burgers quality always trumps quantity when it comes to the menu. The six-year-old fast- casual operation with four locations in Austin, Texas, focuses on what it does best — burgers, fries and milkshakes. "We purchase raw chuck roast and grind it on site for our burgers and bring in fresh Idaho potatoes that are prepared at each location to make crinkle-cut fries," says Marlis Oliver, Mighty Fine Burgers' executive director. "Even our milkshakes are hand-dipped." After numerous customer requests, Mighty Fine Burgers decided to add onion rings to its menu. There was no question that, like its other offer- ings, Mighty Fine Burgers' onion rings would be fresh cut, not frozen. To obtain the highest-quality fresh ingre- dients, the majority of the onions used would be from Texas and the surround- ing Southern states. The frst step in adding this menu item was to assess the competition. "We sampled some of the better frozen brands to taste the best products out there," Oliver says. "We knew that we wanted to hand-bread our onion rings in a traditional Texas style, rather than use a batter." Next, onions were hand-breaded in Mighty Fine Burgers' test kitchen in a method similar to that used for Texas-style chicken- fried steak. "We discovered, with the onion ring volume that is needed, this was quite a chore to do, and the results were inconsis- tent," Oliver says. It was during this testing phase that Mighty Fine Burgers uncovered a solution at the annual National Restaurant Show in Chicago. "We came across Bettcher Industries' Optimax breading machine at the show, which caught our eye," Oliver says. "After watching what the equipment could do, we decided to purchase it to test making onion rings." 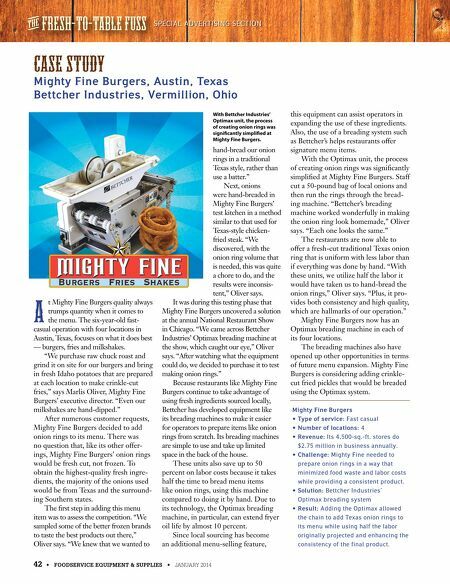 Because restaurants like Mighty Fine Burgers continue to take advantage of using fresh ingredients sourced locally, Bettcher has developed equipment like its breading machines to make it easier for operators to prepare items like onion rings from scratch. Its breading machines are simple to use and take up limited space in the back of the house. These units also save up to 50 percent on labor costs because it takes half the time to bread menu items like onion rings, using this machine compared to doing it by hand. Due to its technology, the Optimax breading machine, in particular, can extend fryer oil life by almost 10 percent. Since local sourcing has become an additional menu-selling feature, this equipment can assist operators in expanding the use of these ingredients. Also, the use of a breading system such as Bettcher's helps restaurants offer signature menu items. With the Optimax unit, the process of creating onion rings was signifcantly simplifed at Mighty Fine Burgers. Staff cut a 50-pound bag of local onions and then run the rings through the bread- ing machine. "Bettcher's breading machine worked wonderfully in making the onion ring look homemade," Oliver says. "Each one looks the same." The restaurants are now able to offer a fresh-cut traditional Texas onion ring that is uniform with less labor than if everything was done by hand. "With these units, we utilize half the labor it would have taken us to hand-bread the onion rings," Oliver says. "Plus, it pro- vides both consistency and high quality, which are hallmarks of our operation." Mighty Fine Burgers now has an Optimax breading machine in each of its four locations. The breading machines also have opened up other opportunities in terms of future menu expansion. Mighty Fine Burgers is considering adding crinkle- cut fried pickles that would be breaded using the Optimax system. SPECIAL ADVERTISING SECTION t FRESH - TO - TABLE FUSS Mighty Fine Burgers • Type of service: Fast casual • Number of locations: 4 • Revenue: Its 4,500-sq.-ft. stores do $2.75 million in business annually. • Challenge: Mighty Fine needed to prepare onion rings in a way that minimized food waste and labor costs while providing a consistent product. 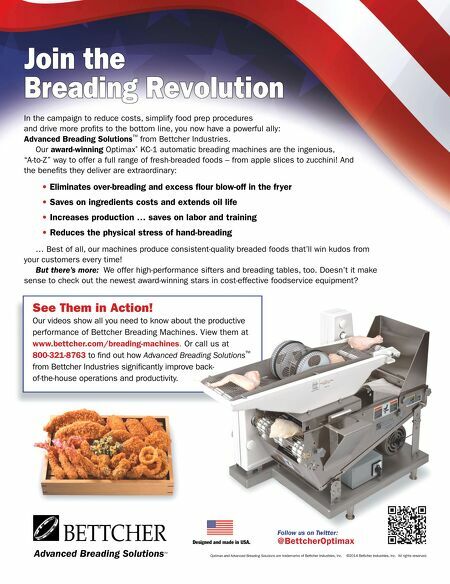 • Solution: Bettcher Industries' Optimax breading system • Result: Adding the Optimax allowed the chain to add Texas onion rings to its menu while using half the labor originally projected and enhancing the consistency of the final product. CASE STU Mighty Fine Burgers, Austin, Texas Bettcher Industries, Vermillion, Ohio With Bettcher Industries' Optimax unit, the process of creating onion rings was signifcantly simplifed at Mighty Fine Burgers.